After the excitement about our summer trip to Paris, it was time to join Eurostar. 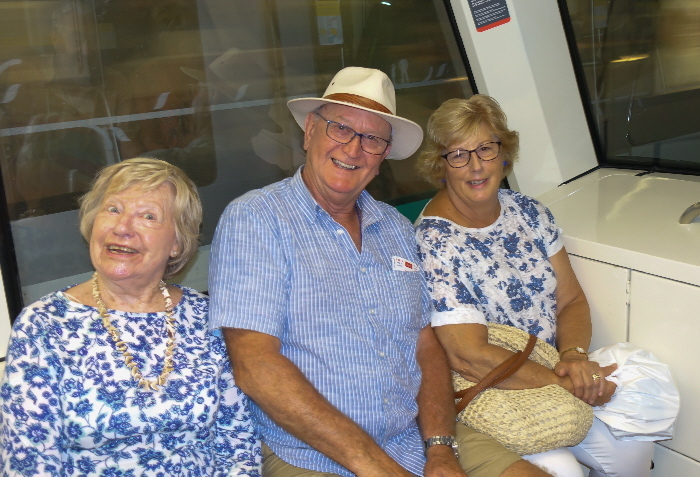 Whether we boarded at San Pancras or Ebbsfleet, because of our number, it felt as though TSCC had almost taken over a complete carriage of the train. Our tour guide Andy introduced himself to everyone – little did we know just how efficient he would be. 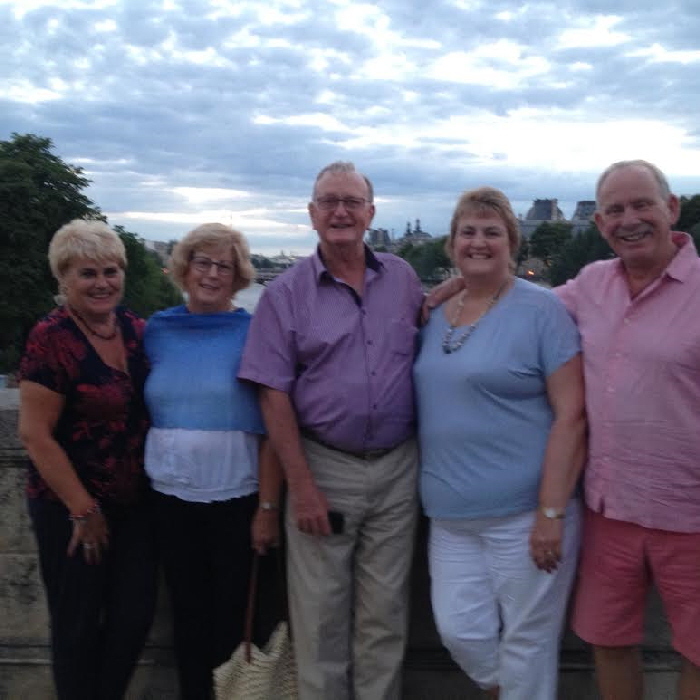 From our arrival at Paris all the planning and organisation done by Mark and Jackie became apparent. On arrival at our hotel in Bercy Village check- in was fast and efficient. After resting in the very comfortable rooms after our journey many explored the village and local park. 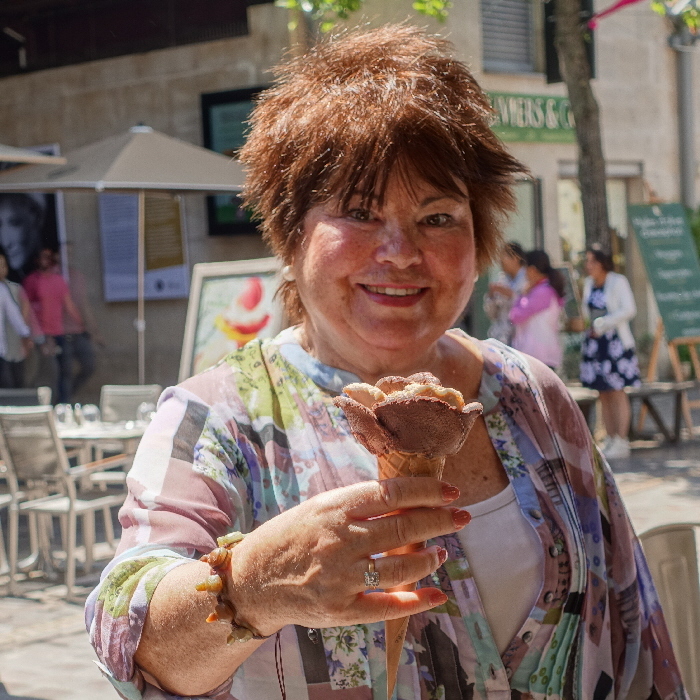 The hotel was in a prime position with the Metro so close and many varied restaurants and artisan shops to visit. Everyone met in the hotel bar late afternoon to get together for pre-drinks before our Friday night dinner arranged at a local restaurant. 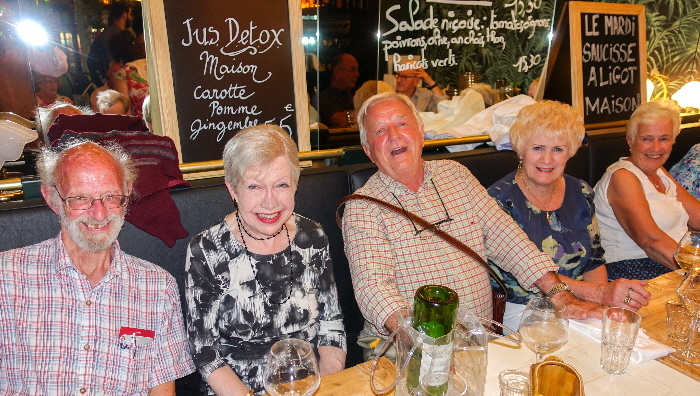 Off we trouped to the very Parisian restaurant with a private dining area upstairs. 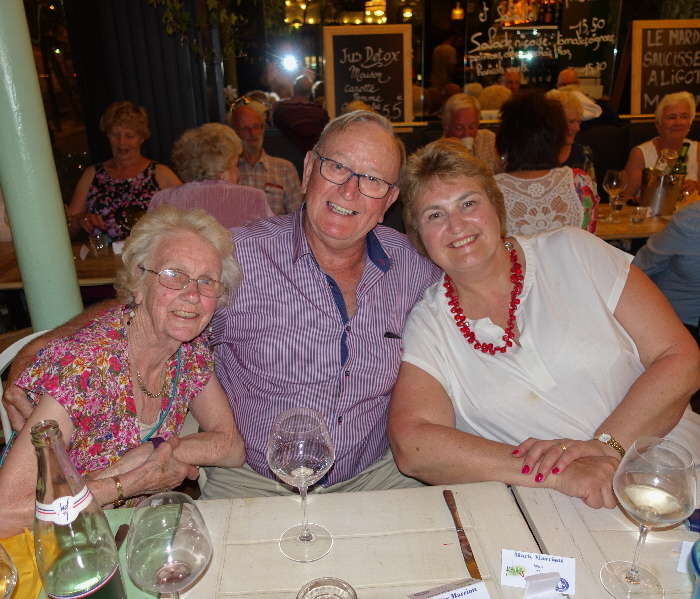 As our meals had been pre-ordered it just meant copious bottles of wine were placed. 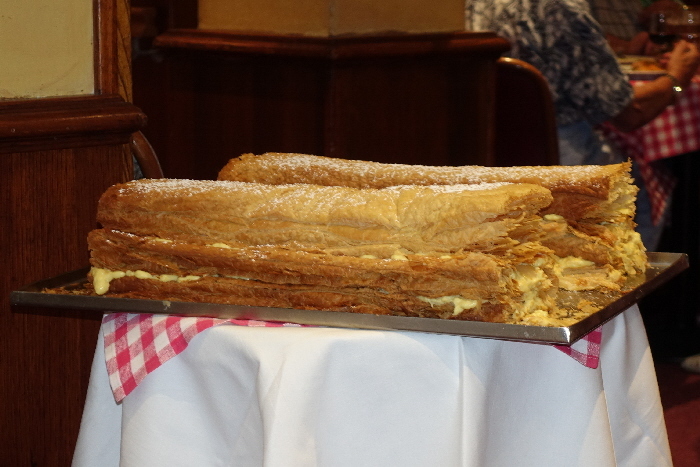 All the food came out quickly and efficiently and everybody enjoyed very tasty dishes, particularly a speciality of the house from the Aveyron region called Saucisse Aligot. This turned out to be far more than bangers and mash as it was plated with a theatrical flourish from a large serving dish. 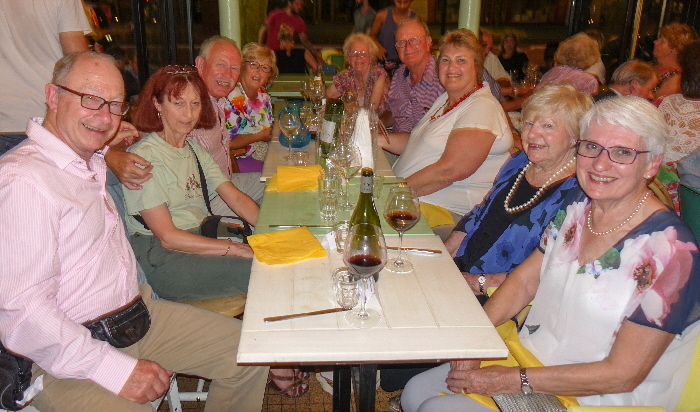 A marvellous evening was had by all with lots of chatter and laughter and after the short walk back to the hotel already looking forward to the next day. After a good night’s sleep and a very substantial continental breakfast Andy gathered everyone together to join the coach for the first part of the day. As the weather was still very warm the air conditioning was much appreciated. 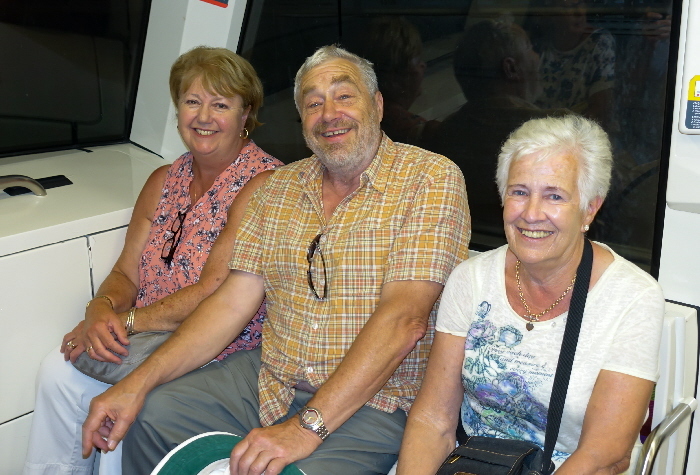 We thought on our journey from Gard du Nord that Andy was very knowledgeable. 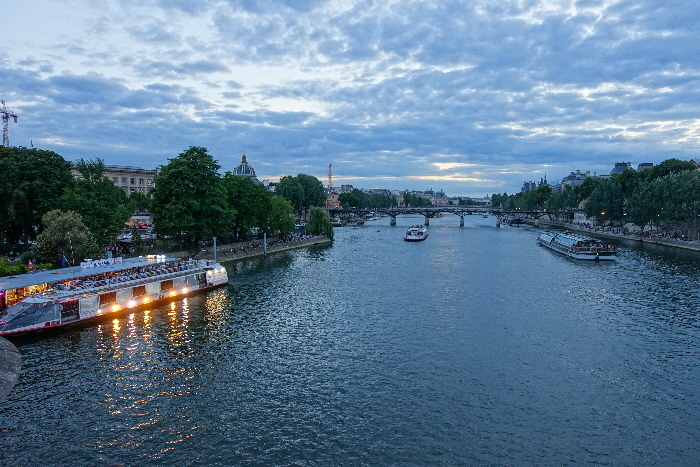 During our comprehensive sightseeing tour of the city passing virtually all the famous landmarks such as L’Arc de Triomphe, Eiffel Tower, Champs Ēlysēes, the Louvre and the River Seine he gave so much interesting information. Even though many roads were shut-off for various events Andy and our driver seamlessly found alternative routes so we did not miss anything. 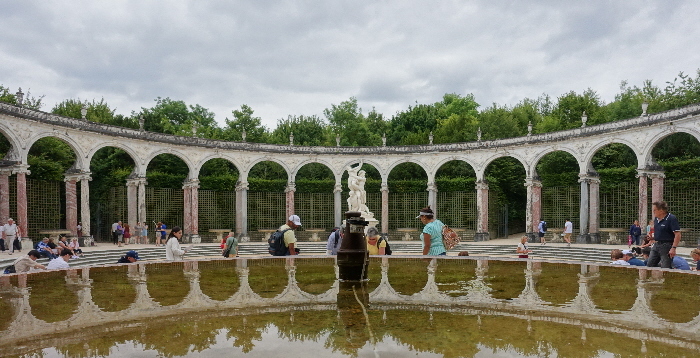 From the City tour we made the short drive to the village of Versailles where we had a few hours to visit the village, the Chāteau and gardens. 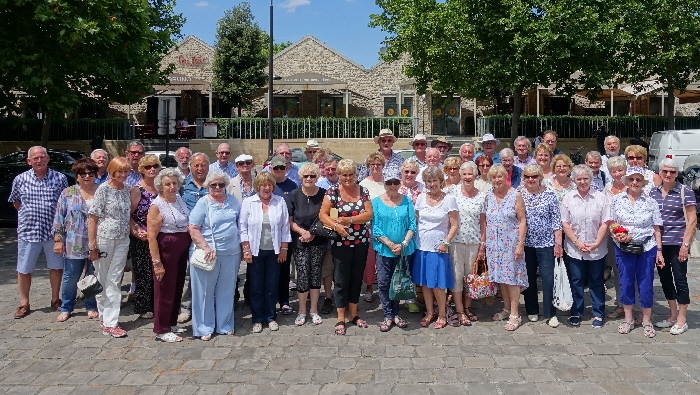 As many members had visited before and saw the two hour queue for the Chāteau, most made the decision to explore and have lunch in the beautiful surroundings, including the gardens and boating lake. 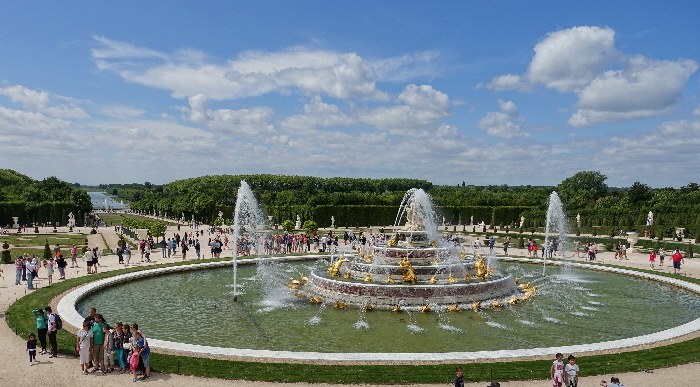 As an added extra we were able to see many of the splendid displays of fountains with the corresponding music which happens on a daily basis. 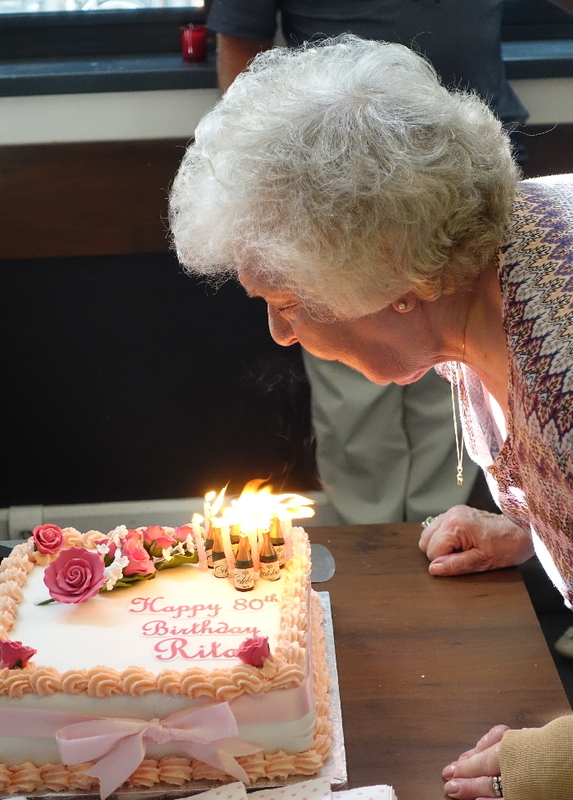 After the heat of Versailles, it was back to the hotel where a surprise had been organised for Rita who was celebrating her 80th birthday. Jackie had baked and transported a marvellous cake for the occasion, together with candles. 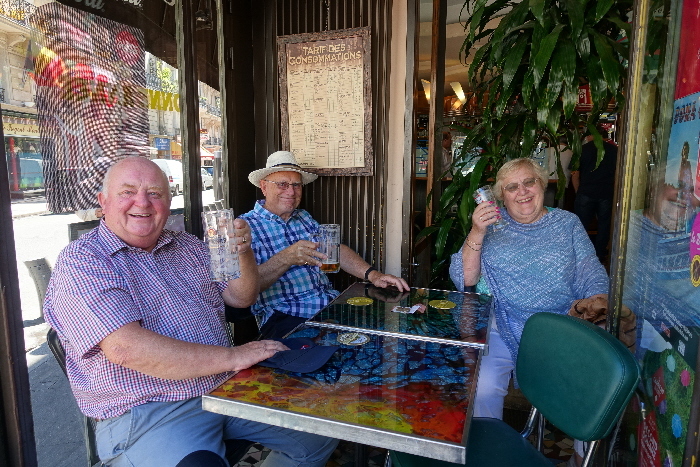 All members raised a glass and voiced Happy Birthday for her special day. 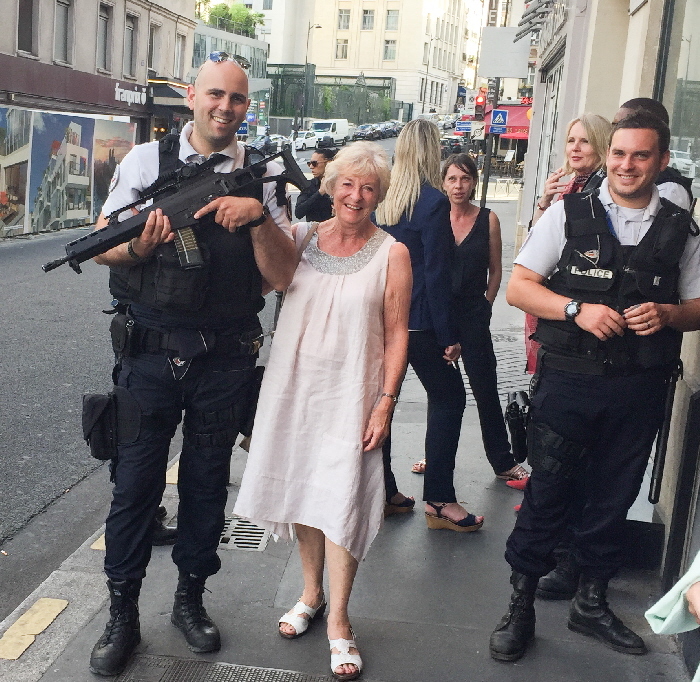 Think she was relieved she escaped having the bumps! There was still more to come after everyone had supper nearby as we had a further tour organised. 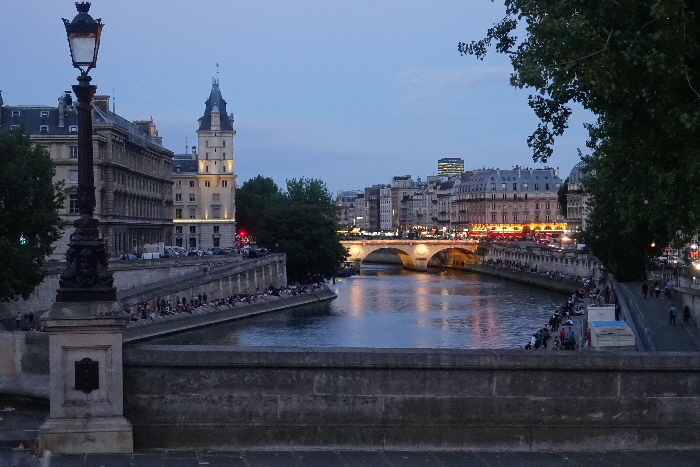 Even though we had our City tour in the morning, Paris by Night was just as exciting, such as seeing the eternal light under the L’Arc de Triomphe. Amazingly, Andy had even more information about the famous sights. 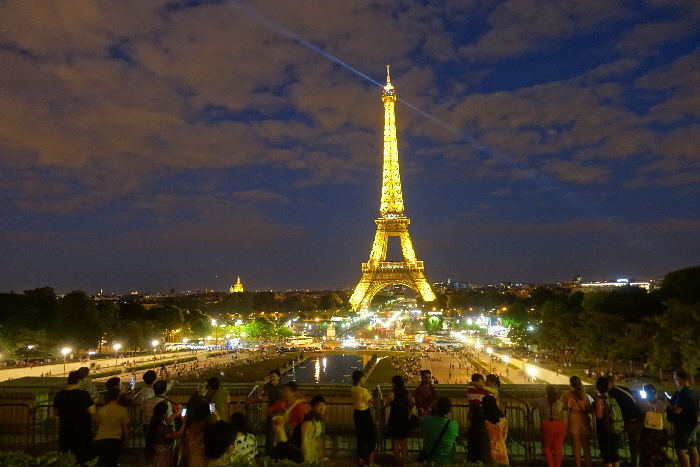 The culmination of the tour took us to steps overlooking the Eiffel Tower with time to spare so that we could see the hourly illumination of lights, truly amazing. Halfway through our visit and everyone was excited to see what was planned for the next day. Day 3 already! 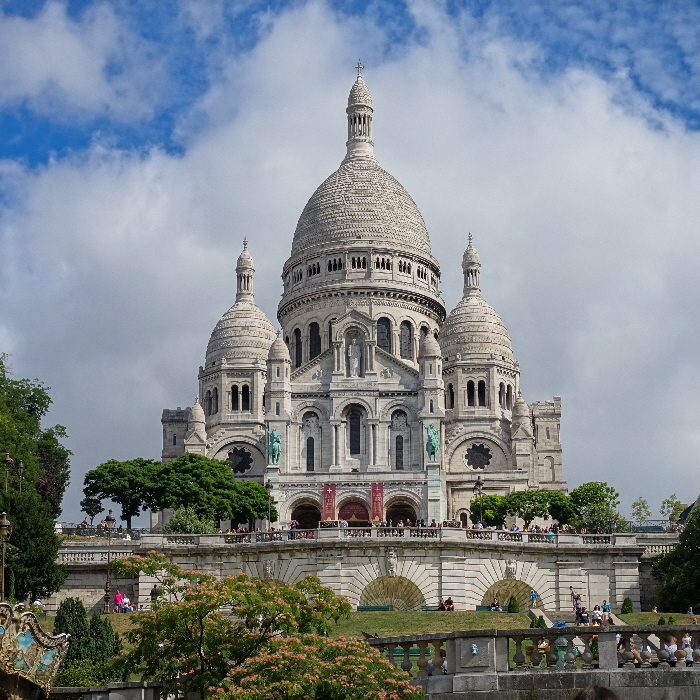 An action-packed day started with a visit to Montmartre which is dominated by the hugely impressive Basilica Sacre-Coeur. 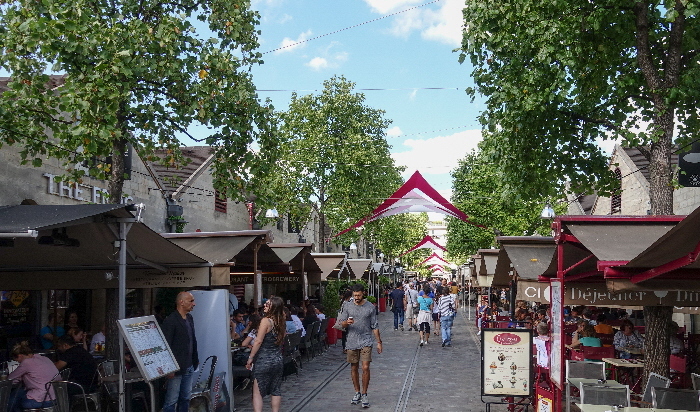 Across the street is the Place du Tertre where the legends of 20th century art used to roam. Now it’s filled with watercolors, portrait sketchers and caricaturists but still has some of the old magic. 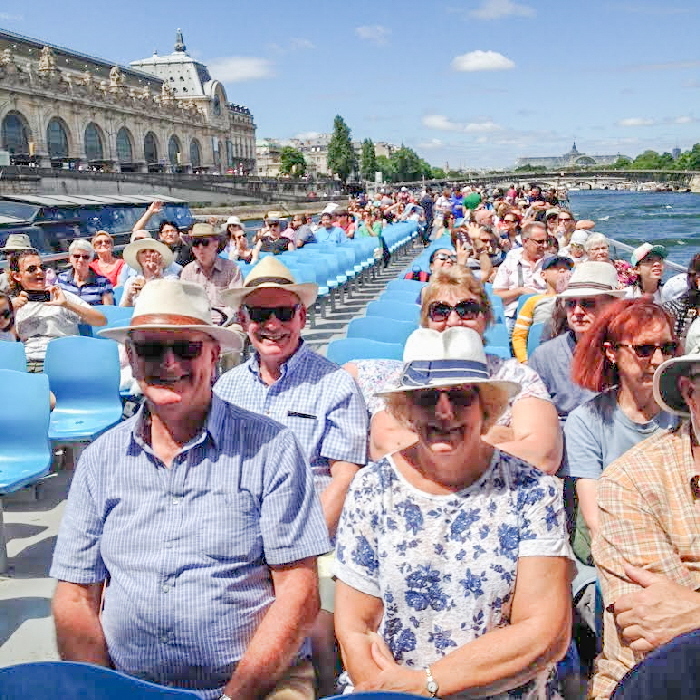 There followed a cruise on the River Seine – a welcome time to relax and enjoy the scenery before some free time prior to the evening’s activities. 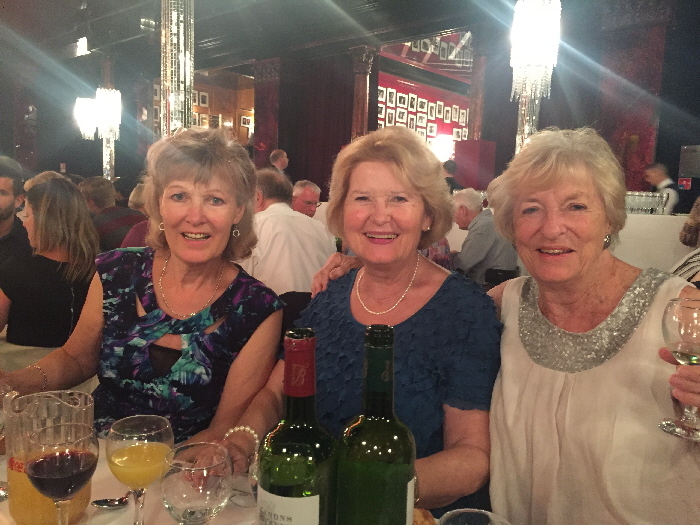 Paradis Latin has been a part of Paris culture since it was founded in 1803 at the behest of Napoleon Bonaparte. The meal, the champagne and the very attentive service were all perfect. 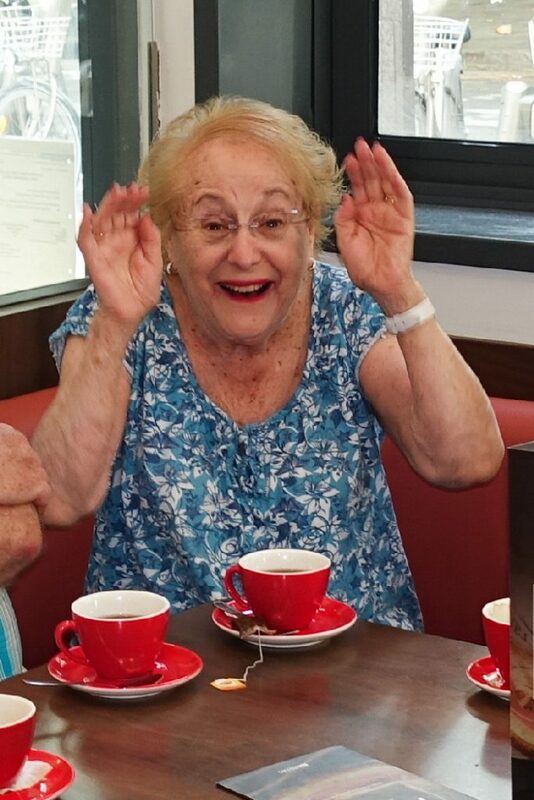 Everyone had a great time. The other part of our group went to La Promenade Restaurant – a modern interpretation of a traditional Paris bistro recently opened by two very hard working young men, Mathieu and Bruno. 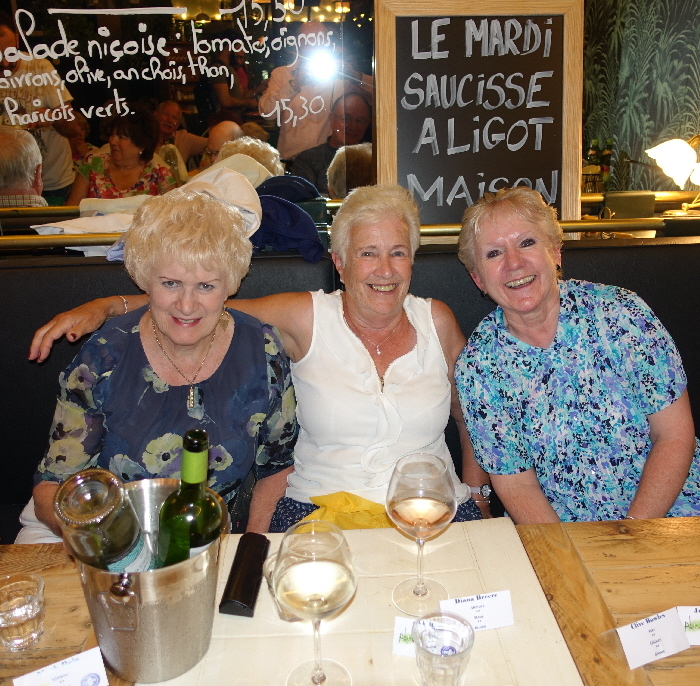 Everyone had a very jolly time and enjoyed the very good food and wine. The final day came all too soon and after a group photo-call, Sally presented our Tour Manager – Andy – with a well deserved token of our appreciation (the hug was a bonus!). Our special thanks go to Jackie and Mark for organising such an enjoyable and memorable event.